Although i haven't heard/read any that vanished like a teleporter before the observer's eyes, quite a few reports have yowies disappearing where they shouldn't e.g in a small clump of trees or in an open area after being obscured by rocks or foliage. I wondered whether anyone had any thoughts in this. They run so fast that they can get quickly out of the area. They are that tied into nature - the closeness of regular animals to nature combined with near-human inelligence. So they can lie down in exactly the right place, use trickery or camoflage. They live partly underground - the Great Artesian Basin or suchlike? Or they are strong enough to dig a foxhole real quick. Yowie fur is chameleon-like but not always active. Different colours of yowies - black, brown, gold, red, grey are the fur in standby or default modes. All of the above (except changing hair colour), but I believe mostly they just stay perfectly still. I am sorry to say that they actually vanish into thin air. The book X2 by Adrian Dvir describes the mechanics of it. Basically, they are trans-dimensional (aka interdimensional) with the ability to shift into various sub-dimensions of the 4th dimension, to further modify their stealth capability beyond just being invisible. I heard one walk up behind a bush, I watched something dark form behind that bush, as I took a few steps towards the bush, I watched the dark object disappear and then I heard it walk away on two feet. I have also had dozens of invisible Bigfoot walk or become noticeable by me when they were within 10 feet. I also spend everyday of the year with smaller invisible people. There tricks do not stop there. What do you mean spending everyday with vanishing people? I was looking for the book you mentioned X2 Adrian Davr, I can't find anything. Would you have a little more information. Hey Zed seems its Adrian Dvir not Davr, and the book is X3 not X2. Sounds a lot like the " Power Energy" healing clinic that were popular in the 1970s. Will have a bit of a look and see what it is about. I have been reading some excerpts from that x3 book on a website, it looks like the alien healing didn't work to well, he died of a disease! Proof that we are literally perceiving things in the past is the 80-millisecond rule. The cost of hiding the logistical details of perception is that we are always a beat behind. The brain must strike a balance. Cognitive psychologist Alex Holcombe at Sydney has some clever demonstrations showing that certain forms of motion perception take a second or longer to register, and our brains clearly can’t wait that long. Our view of the world takes shape as we watch it.The 80-millisecond rule plays all sorts of perceptual tricks on us. As long as a hand-clapper is less than 30 meters away, you hear and see the clap happen together. But beyond this distance, the sound arrives more than 80 milliseconds later than the light, and the brain no longer matches sight and sound. What is weird is that the transition is abrupt: by taking a single step away from you, the hand-clapper goes from in sync to out of sync. Similarly, as long as a TV or film soundtrack is synchronized within 80 milliseconds, you won’t notice any lag, but if the delay gets any longer, the two abruptly and maddeningly become disjointed. Events that take place faster than 80 milliseconds fly under the radar of consciousness. A batter swings at a ball before being aware that the pitcher has even thrown it. 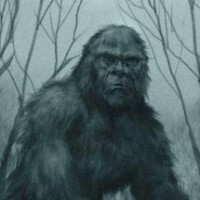 In my experience in the field with Bigfoot activity they generally keep a distance of 70 yards or more apart from you. I have had trees pushed down at these distances and it seems the 80-millisecond rule rings true. No sign of the Bigfoot except the fallen tree. I have no doubt this lag in our perception is utilized by them with their ability to run and jump out of eye sight before we register they are even present. A quick blur here a faint tree branch swaying there and the elusive Bigfoot appears to disappear. Nothing Supernatural, just super nature, plain and simple speed and reflexes!" Well this is fair enough and adds up with what people are reporting. Moving so fast you cant see them and just appear as a blur. Standing perfectly still is another reasonable non supernatural explanation. Still doesnt explain how they dissapear from a standing position. A physical being would surely need a bit of a run off to reach that type of speed? Zed wrote: I have been reading some excerpts from that x3 book on a website, it looks like the alien healing didn't work to well, he died of a disease! Zed I am not surprised, the book looks a bit out there. I was talking to a Sherriff while he was in his car in front of a closed gate, and I was standing next to his vehicle. He wondered why I wanted to get into the area behind the gate and I told him that there is supposed to be a lot of Bigfoot in there. In the next instant, out of the corner of my eye, a 12" diameter tree was sheared off about 3 feet above the ground and the trunk only moved sideways before stabbing into the ground since the branches were hung up in the canopy of adjacent trees. As I looked at the tree in motion, I notice a dark cloud disappear without moving left or right, but remaining in place. That experience would tend to blow your previously unheard of, "80 millisecond rule", out of the water. Always interesting to hear from you themanfromglad you're at the top of my must read posts. Boab Bob wrote: Although i haven't heard/read any that vanished like a teleporter before the observer's eyes, quite a few reports have yowies disappearing where they shouldn't e.g in a small clump of trees or in an open area after being obscured by rocks or foliage. I wondered whether anyone had any thoughts in this. Yes, this seems to be a recurring theme. There used to be reports of Bigfoot doing this in America, too. people couldn't understand how they were managing to disappear from view. Then a couple of reports may have revealed their trick: they were seen to drop flat on their stomachs and crawl away quite quickly. At least one was seen in daytime and another by IR vision. Even a very tall Bigfoot could be hidden by a small bush if it was laying prone. I'm not suggesting they aren't also very quick, well camoflaged and crafty. I just don't think any "supernatural" explanation is necessary. Mad Academic wrote: I just don't think any "supernatural" explanation is necessary. Whether it's necessary or not it's happening and we have seen it happen , how many times do we have to spell it out for you ? Sorry for my outburst hehehe , it does get very frustrating sometimes . They ARE doing things that are unexplainable . This is the truth , I have no idea how . I never chose to see it , but I saw it anyway . Rusty has a point, we all have an outburst now and then, its a frustrating thing this Yowie research. To put in so much time and effort and feel as tho you get nowhere. To those who think they are a lost ape species and are purely flesh and blood, that can just duck down and play dead or hide behind a tree with their matted hair to evade detection for close to a hundreds of years, even with all the land development and advancement of technology need to have a good hard look at the situation. There is more than meets the eye to this "spiritual phenomenon" and I like to call it that because there is no hard evidence at all to a F&B ape species in fact they act more like a ghost than they do a F&B ape. Anyway good on Rusty for offering a apology, we are all here to learn from one another. Rusty2 wrote: Sorry for my outburst hehehe , it does get very frustrating sometimes . You have had different experiences to me. Obviously I cannot comment on them, because I wasn't there. However, as a scientist I must operate by the principles of Occam's Razor (use the simplest explanation first, until disproven). So that is what I will do until I am lucky enough to see one for myself. I can appreciate where the F&B people are coming from , I really can because I was once in that camp . From where I sit now it would seem that not everything has an explanation . I won't be losing any sleep over it , I know they exist and that's enough for me . God luck to everyone in their search for truth ! I agree with you totally. Not everything has an explanation. My take on the hairy people is that they exist within a level of physics that is foreign to us and that we will most likely never understand. One thing though. Many of the indigenous people , in particular those with a relationship to country/culture , seem to have an extra sense compared to us whereby they seem to be able to see and/or feel the presence of the spirits of the hairy folk and other things.Indigenous people have had contact with hairy folk/spirits for maybe say 60,000 years approx which has given them much time to observe and understand them. So we should listen to and be guided by and learn from the aquired knowledge of indigenous persons. It is said that the hairy folk of each continent/island actually resemble the indigenous persons of that continent/island so if that is the case then I think it is reasonable to assume that indigenous persons of today have interbred or in some other way decended from the hairy folk/spirits. Still , I think we will never know exactly how/why this all transpired over time. Re... Noogar people info/quote at bottom of this post. Note...... you’ll bring the mummaries and woordatjis up. That’s the spirits. so they say you bring the spirits up......... so spirits are coming up from the earth ? where else could they come up from. i recently made another post whereby I was told the story of an indigenous man out on country walking along when a hairy person suddenly materialised from the earth directly in front of him. so if they can come up from the earth then I suppose they can go back down into the earth. … Noongar people are very spiritual people and you know if you do something, if you kill something for the fun of it then you know something will happen to you so you know you were taught that and you were taught about rules. You know when we sit around a campfire you’re not allowed to whiz the sticks around because you’ll bring the mummaries and woordatjis up. That’s the spirits. So you know growing up in the bush … where the rules were pretty well known. Personally, I am firmly in the F&B camp. However, in saying that I also 'know' there is far more 'science' than today's science currently understands... in other words, 'Magic' is simply science not comprehended by the ones thinking it to be magic. For example, humans only see in part of the complete light spectrum, for all we know there are countless entities all around us that could only be seen if they reflect infra-red, or even infra-infra-red. The same with sound, ie; ultra-sound and infra-sound. Vanishing Yowies could be because they have evolved the ability to 'shift' inside the light spectrum, or use infra-sound to confuse us, or even can 'skip' the dimensional 'walls'. 100 years ago the phone you carry in your pocket would be considered very advanced 'magic'... hell, even the landline telephone was thought demonic by many christians when it was first introduced. I can demonstrate telekinesis right in front of most people's eyes by holding two matches and making one jump off the other (I say 'most' people because very few know how it is done and that is how it appears to them. Several times I have watched in amusement as others literally strain their brains attempting to move the match with their own minds ). I can also pull my thumb off right in front of children's eyes, convincing them that it is a 'removable' thumb... because they do not know the 'science' behind it. 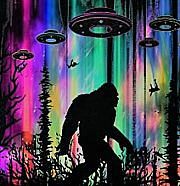 Interestingly, on Brian Sullivan's latest show he mentions Sasquatch hair as being partially 'hollow'... which could mean it absorbs surrounding colours to a degree, making it even harder to see them when standing perfectly still. ... in effect a natural version of an 'invisibility cloak'. Rusty2,Dion I'm with you 100%. The F&B, chimpanzee, Homo Naledi, Gigantopithicus brigade can argue their case till ''the cows come home'' but until they come up with a dead Yowie or Bigfoot (never going to happen) then I will never be convinced. TheBlackStump wrote: Re... Noogar people info/quote at bottom of this post. TheBlackStump I agree with you. The Noongar and other indigenous peoples around Australia deal with these creatures on a continual basis; they don't sit around campfires and pull out their Yowie manuals to double check that everything they see is authenticated by the high priests of scientific B/S. They know what they encounter and at the same time, show fear and reverence towards these creatures. Guys its silly to be in any " camp". Its not like were choosing sides in a football match. We are talking yowies and bigfoot here. These things arent supposed to exist according to the " real world". Nobody has been able to prove they even exist and whos to say there isnt flesh and blood AND paranormal biengs out there. I made a post in the other section last night and man did i cringe this morning when i read it. Not because i was intoxicated or anything. I was inspired by Rusty and Dions HONEST and learned opinions and felt it may be of interest to black stump and others. Thankfully i deleted most of it but really why should i have to keep things to myself? We all look like loopers to outsiders anyway but theyre the ones living in a false reality. Not us! I will say also that those looking for a ferocious giant ape. Be careful as you may get exactly what you wish for!